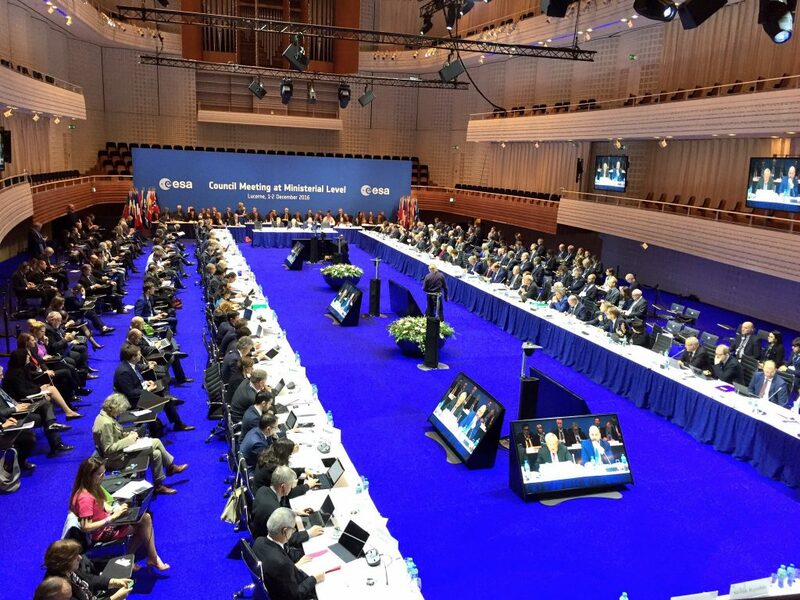 For two days, as the ESA Council at ministerial level met to decide on the future of ESA and its programmes, Lucerne, Switzerland, became the capital of European space. Ministers and delegations from all 22 ESA member states, associated state Slovenia, cooperating state Canada, representatives of the European Union (EU) and of those EU member states not members of ESA together with observers from a number of European organisations, all met in the Lucerne at the Culture and Convention Centre (KKL) to participate in what turned out to be lively discussions. 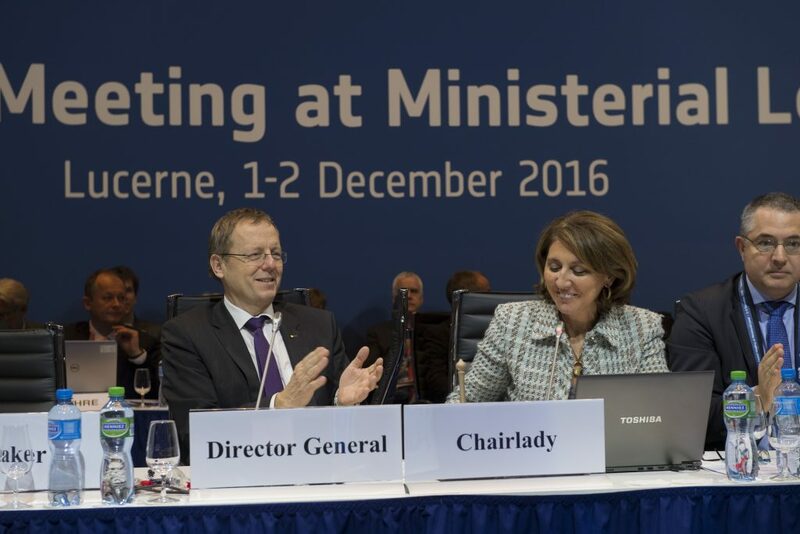 ESA Council at ministerial level in Lucerne, Switzerland, 1-2 December 2016. Credit: ESA, C. Diener. The first important step came when Council gave its backing to my strategy proposal “Space 4.0 for a United Space in Europe”, outlining how to move ESA forward while taking into account the shifts in paradigm occurring in the space sector and how to further develop the European dimension of space. Although the strategic direction of the Agency is of the utmost importance, it immediately became clear that the real focus of the discussions would be the subscriptions, the amounts committed to the different programmes. In exhausting meetings conducted both day and night, solutions had to be found that would take into account national interests while also securing the substance of the various proposals. To do so required multiple rounds as member states held out for their respective interests while presenting their mutual demands. Tactical manoeuvres dominated the discussions while issues of national affordability were never far from the surface. Subscriptions were announced and then withdrawn again, making it almost impossible to identify a clear way forward. In the end, more than 10.3 billion euros were put on the table, constituting a major success overall. 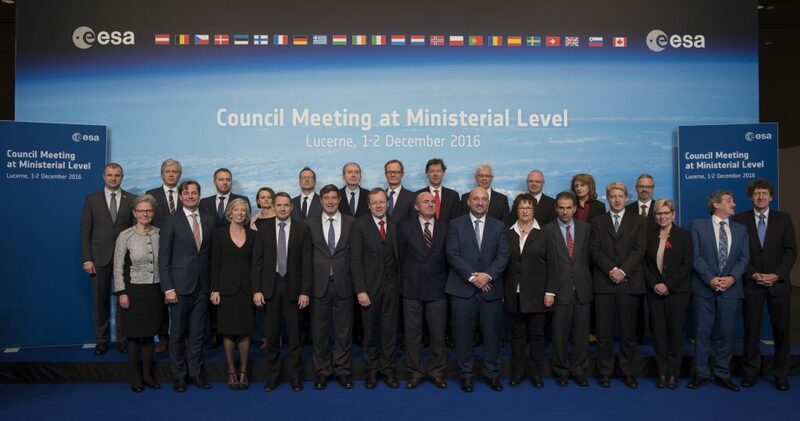 ESA Council at ministerial level in Lucerne, Switzerland, 1-2 December 2016, official group photo of ministers. Credit: ESA, S. Corvaja. However, there was one aspect which detracted from the otherwise positive mood: AIM (short for Asteroid Impact Mission) failed to get the financial support it needed. AIM had been intended as a learning exercise that would form part of a joint NASA-ESA activity to evaluate the technical possibilities of changing the flight path of a tiny asteroid moon. It was an example of ESA at its absolute best: daring, innovative and ambitious all at once. Although, in the beginning, very promising subscriptions were given, the withdrawal of the biggest single amount at the very last minute proved devastating to an important mission with great potential for worldwide visibility. Following on from Rosetta, AIM had the ability to inspire the public by investigating how to deal with an object hurtling towards the Earth. The overall mission costs were estimated to be just about 2.5% of the overall subscriptions; the direct needs were only 1%. Ultimately – and this I very much regret – the difficult discussions among member states and a focus on direct applications and short-term return led inevitably to a situation in which I had no choice but to announce the proposal’s cancellation. The door was slammed shut but as I am convinced of the necessity of such a project, I will try to find a way back in through a window again. It is simply too important. There is still some more to be done before we can say we have truly achieved a United Space in Europe in terms of comprehensive understanding and behaviour. In any case one can state that, in terms of the big picture, the Ministerial was a success and I would like to thank everyone who contributed to that. For me it was a special challenge to represent the ESA Executive in such an environment but, due to the excellent support I received from a great many individuals, in many respects my task was ultimately made very much easier. I would also like to extend my sincere thanks to Switzerland and the Swiss Delegation for their great hospitality as well as their efforts in co-organising this important event with us, and to Spain for chairing the 2016 Council meeting at ministerial level and agreeing to be the host in 2019. Thank you for this blog post, Mr Worner. I was also deeply saddened by the decision to cancel AIM, it was a very innovative and highly-inspiring mission, and one that would obviously echo the tremendous success that was Rosetta/Philae in people’s memories. I am thus relieved to read you are determined to keep the project alive. But may I ask you what could be done, realistically? And how likely it is that the mission eventually gets the funding it needs? To impact Didymoon in 2022 we would need to find a way to continue the industrial work right after the current phase which is finishing in 2017. Is this 10.3 Billion € budget a annual budget or for 4 years, until the next meeting? I’m thinking this is the budget for four years that the member states contributes. The total budget would also include the mandatory part and that from other organisations such as the EU. Do I have a correct understanding of how the ESA budget works? I can’t find any concrete description of Space 4.0i, will this be spent on programmes such as ESA-BIC and more or will new programmes be formed that will be anounced later? Very sad to hear about the Asteroid Impact Mission. Hopefully there is a way to save the mission. thank you for your efforts! I would like to express my hope that the AIM mission, or another version of it, comes back to the agenda soon, as the topic of the hazards of asteroid impact is a real one, as can be easily demonstrated by the evidence of impacts in the geological record. Such a mission can be not only of scientific and social importance, but also mobilize the interest of the general public, as can be seen by the success of the “Asteroid Day” events over the past two years. This is a threat that cannot be ignored for long! Thank-you for looking out for the Earth. The science lovers of the world stand by you! It is very sad to read that the innovative and important project AIM was cancelled. AIM was planned to be a combined NAS-ESA project and cancelling just one part of it make the NASA part alone “useless”. While I understand that budget is critical these days, we shouldn`t cancel ground breaking research projects like AIM which over long time could be very important to protect mankind. AIM would have been the necessary proof why space research in important at all and every Euro spent is wisely spend. Hopefully this chance isn`t fully gone. Dear Mr. Woerner, I hope you can find the way to implement AIM. However I guess this mission has a clear deadline, the encounter with the binary asteroid, which also dictates the timing for cooperation with NASA. How much time do you have? Is it realistic? thank you for believing in the AIM community! I was lucky enough to get to know a few people of the AIM mission team over the last year during my PhD and it’s such a motivated group! Not only is the science fascinating, inspiring and innovative, but it is also driven with the right spirit. There is no doubt that without having previously had the opportunity to successfully test a deflection method for asteroid mitigation, in a real environment, prior to the discovery of an asteroid on a collision course with the Earth, we are left unnecessarily vulnerable and exposed to this naturally occurring hazard. I really do hope that the ESA Council has the opportunity, in the not too distant future, to review and reconsider their decision and approve not only the funding for AIM which is essential, but also the partnership working with NASA and the AIDA mission. The decision at the ministerial level on AIM is not only saddening but to an extent heart-breaking to those who are and continue to be inspired. There was a lot of hope and this hope lives. This is a mission many looked out to be achieved. There is hope at the end of the tunnel and reconsideration on this decision. For decades it has been a widely accepted fact that asteroids and comets pose a serious threat to mankind’s and other Earth species’ only living environment as of today. While I am glad that ESA got significant funding for other missions of highest importance, it was a disappointment to learn that for AIM there would not yet exist the necessary political and financial backing. Some statements sounded as if this decision were not an ultimate one, though. And indeed, with every single year waiting for beginning the essential (practical) scientific research, precious time would be wasted, and the risk of not being able to react properly to space rocks with trajectories leading directly towards our home planet Earth, would get higher – and eventually too high. I described the AIM mission in my book “Incoming Asteroid! What could we di about it?”, so it has to take place! Seriously though, this is a very important piece of research, for the reasons outlined in the book, and because we can’t see into the future, we can’t see that its benefits are either short or long-term – only that they are real and the information is needed for effective planning to meet the threat when it does arise, as some day it must. From a paleontological perspective it strikes me that geological history teaches us protecting the Earth from an extinction level event is absolutely the highest priority humanity can have at this time. The neglect of studies relating to this endeavour is the gravest error imaginable. Very unfortunate that a viable asteroid deflection method may not be tested. Hopefully funding for the AIM mission will be forthcoming. The AIM mission is too important for humanity and the world! Please find a way to fund it. AIM makes sense, as it can provide an early warning for saving lives in some areas of the planet. Wonderful news – except of course for the cancellation of AIM. Given that asteroids are nature’s way of asking how that space program is coming along. I really hope that you can find a way for AIM to happen after all. I am also sure that I speak not just for myself when I say that I’d be glad to help where I can. Asteroid redirection is the most critically needed space capability right now, both for planetary defense and economic exploitation. Shameful that missions to examine red dust in ever greater detail sidelined the Jupiter Icy Moons Orbiter, Titan Mare Explorer, and now AIM as well. It’s time to shut the door on Mars. It has no use or relevance to humans in the foreseeable future. Thank you for that nice blog, Mr. Woerner! I was very sad to hear about ESA’s decision not to fund AIM in its current form. This could be a real milestone, both in terms of international collaboration and planetary defense. I hope there will be a way to save the core of the mission, in any form! As you said: It is just too important. I, too, am deeply saddened by this decision. Just watch the nay-sayers wringing their hands when the big one comes barrelling in from the Kuiper Belt. . .
Me decepciona que nuestros políticos (y algunos científicos) no alcancen a ver la importancia de este Proyecto. Espero que encuentren una manera de reconsiderarlo. How sad that they are not willing to pull out all the stops to save our planet. Thank you for the effort to advance AIM! If Planetary Resources can raise $1.5 million in a month through crowdfunding then it should be possible for much more to be raised for AIM. Every city where there are centers involved in the work could help promote the idea. We are talking long term survival of humankind along two vectors. Space mineral resources are the basis of the future space economy. AIM is a critically important step towards the development of a self-sustaining space economy that would make horse-trading as must take place with limited public funds moot. If Luxembourg can as a state allocate over $200 million to make itself the asteroid mining capital of the world Luxembourg could step forward to start the crowd funding for AIM. The Chelyabinsk event in February 2013 from a slightly different angle could have caused major damage to the city. Such an object is of a size that could conceivably be redirected. Over Paris, Rome, London or Berlin the event could have been catastrophic. This is an extremely urgent problem whose resolution must be pursued relentlessly! It is a pity that the AIM project was canceled. This is an expected response of rational (on a short time scale) ministers. Same in Russia. Let us hope that the project will not be buried until the next Chelyabinsk type event. Mr. Woerner’s comments give some week but positive expectations. Asteroid Impact Mission is a relevant issue we need to be aware of, I definitely support it, because we need to raise awareness in our societies about Asteroids, I hope in the near future we could have more access to funds to work worldwide, there’s a willingness from people around the world to bring the message of importance of these issues. Thanks for your efforts in helping protect the Earth and all life from annihilation. It seems a very short-sighted decision to cancel AIM. I would urge you to seek every avenue to reversing this decision. This is an important mission. I hope you can continue your efforts. The support of this mission would benefit all of mankind. Thank you! My family would have loved to see this happen. Especially since one person is a professor of astronomy. It brings him great joy finding new information about his field. When he does he has this need to passionately relay it to everyone. It would have kept him entertained for life. How very sad to hear that the Asteroid Impact Mission (AIM) did not receive funding. I believe this mission could be crucial to the future of our planet. I hope that there is a way to save the mission. Thank you for your efforts! The AIM proposal is a significant engineering/methodology step toward defending the planet. The importance of it’s revival in a useable form can not be overstated. Unfortunately, politics is rarely in defense of people or long-term goals. May wisdom grace us sooner rather than later. Don’t worry, in one form or the other, this mission will happen in the not too far future. This is just a temporary setback. It is the typical human condition, until the earth is in the path of an asteroid and the danger is imminent…they will do nothing and less to allocate funds to the project, as I said, it is typical. I would like to ask the short sighted Politico’s who failed to fund AIM, what they intend to spend the money on instead that will make a damned bit of difference when there is an asteroid headed their way? ESA has a Director of Science with his scientific staff, and a scientific advisory structure including world renowned scientists , what is their opinion about the scientific value of AIM? Would the ESA Science Programme invest in AIM? Your effort to save the humanity is really appreciable! Hope this hurdle will be overcome soon! We need to fight real universal dangers and not each other! Do any of those who chose to cut funding for AIM remember Chelyabinsk? WHAT is it going to take, a city getting destroyed before the humans who CAN do something about this, DO something about this? Beginning to demonstrate an ability to deflect asteroids (and later comets) is crucial to the survival of civilization, and even humanity itself. This is a tiny, tiny amount….. by comparison, how much does Europe spend on cosmetics every year? this has got to be the best comment so far! GREETINGS FROM LOS ROBLES ASTRONOMY CLUB !! WE COMPLETELY AGREE WITH YOU SIR !! SADLY, A DISASTER MUST HAPPEN, SIMILAR TO CHELYABINSK IN ORDER TO “AWAKE” THIS NOBLE MINISTERS AND THEIR ASSESORS !! It is very sad that we miss this important oportunity to perform an in situ test of how deflecting dangerous asteroids, but we hope that today’s decision of the United Nations General Assembly about impact hazard make think the European Union governments about the need of passing to the action. It is devastating that AIM was not funded, especially at such a late stage of negotiations. This mission is not only interesting, but could one day mean the difference between survival and extinction of our species and life as we know it. It is imperative that it gets on the way. Science NEVER lie…!!! This is for all. And it would be great if ESA fund such a mission. If ESA doesn’t care then who does ? So sad that the asteroid threat is not taken as an important reason to spend bugdet this year….I trully hope that this will change soon in the future……. Thanks for posting. I think we should not be heavy hearted about one defeat and keep on pushing for this very important mission! Europe / ESA has been great in terms of small body exploration and I am sure AIM will find a way to realise. I fully support your efforts to develop the Asteroid Impact Mission. I think this could be one of the most important contributions Europe could make to humanity. When I started to study near-Earth asteroids in the early 1980s, we only knew of about a dozen. It you discussed the asteroid impact hazard, you were ridiculed – that ‘you don’t understand the immensity of space’. Now we have found 15,000 objects, and many are added each week. And we have found only a fraction of the most common threats (around 100 meters diameter). The world assumes we are working one this and have a plan. I was hoping that the cleverly designed AIM was a major part of that plan. Perhaps the other ministers should start working on a draft of their *post-disaster* public statements, when people will ask them why they took this step backwards in 2016. So sad now. The AIM project is necessary… It’s an important mission. Por favor recondidren la mision European Asteroid Impact Mission (AIM), nos puede salvar la vida. I don’t understand why Earth Defense is not a priority… Seriously. GREETINGS FROM LOS ROBLES ASTRONOMY CLUB, !! perhaps if a world concientization campaign would be started?? coulndt it be posible to request economical support from other countries, even 3rd world countries could perhaps help with whatever their small budgets could supply !!!??? We are afraid another tunguska or chelyabinsk event will have to happen in order to awake citizens around the world !! God help us !! Asteroid impact mitigation is a truly relevant topic. AIM would be extremely important here, let’s hope it can be saved. I’m very sad to hear about the cancellation of the AIM project. Success on an eventual future deflection of an asteroid or comet, comes from what we can learn about the technique in question. It’s learning by doing, guys! If we can’t learn, then it becomes very hard to learn or to gain the required knowhow… almost impossible. As a “retired” space-engineering student, I strongly urge politicians to reconsider this sad decision, or to look for alternative targets to the mission. As Jan woerner said it’s simply too important. I think there’s a big economic and technological gain in the long term for this mission. Not only for Europe as a whole (…not to mention the rest of the World), but also for engineering students, since the mission it self would have had to use cubesats, among other new instrumentation. By the way, thank you Jan Woerner for visiting Copenhagen this year. The current cancellation of AIM is terrible, but I am heartened by the commitment you are displaying in not giving up on it, and more generally, by the explicit commitment to planetary defense shown by ESA in this endeavor and others. Most of us are committed to scientific discovery and the exploration of space as well, but it is absurd to relegate planetary defense to last position when every other human enterprise whatever is put at risk by our present unpreparedness to deflect or destroy potential impactors. It should also be noted that AIM, and AIDA overall, would be only the beginning of the research and testing program needed for a robust planetary defense, which ultimately requires building an infrastructure that could ward off incoming asteroids and comets of all sizes and with very little advance warning. Thank you for your efforts. Thanks for extending the ISS mission length. It is a crucial testbed of commercial technologies, as well as technologies to improve our quality of living on earth. I am dissapointed with AIMMISSION now being in limbo. With so many member-states already participating at the phase 1 level I saw this mission as ESA’s commitment to planetary science; small body science; and planetary protection. I would assume DART / AIDA partners NASA and Johns Hopkins University Applied Physics would want a confirmation of ESA’s commitment to AIM; as those institutions have already made commitments expecting ESA’s vital participation. I hope this issue gets resolved as soon as possible (hopefully with full funding). I am really disappointed that the development of AIM was not allowed to proceed. I think it is the space exploration mission that is most relevant to life on Earth, on the same level really as Earth-observation missions are important for our daily life. Asteroids and comets are the only thing in space that can really touch Earth as the Chelyabinsk meteor showed. I think Europe should not let its lead gained from Rosetta & Philae slip away like that. Also, now there is not just talk about but real companies working on asteroid mining, so it is also becoming important for the economy. And the cooperation aspect with NASA has become so much more important now! I was so deeply saddened and disappointed that such a vital, smart and inspiring mission like the Asteroid Impact Mission did not get full funding. Like ESA Director General points out, testing asteroid deflection capabilities is simply too important! Our home planet’s future is at stake. Thank you so much for commitment and efforts to save the mission and for keeping up the much needed work for planetary defense at ESA! Can’t add much to what others have already said in the comments. I really hope that you find some kind of path forward for AIM. I felt honored to participate in the Citizens Debate last September and it was very clear that ESA is doing a great job with comparatively modest resources, and that those resources need to be increased. Although it is great news that the Council is supporting ESA it is disappointing to learn of AIM’s cut. Mr. Woerner is right: it is simply too important to let go. I read somewhere that only 35M are needed as Germany was willing to support the rest. This is 7 cents of Euro per inhabitant of the European Union. Are we being told we cannot bear this effort? I’ll go ahead and donate 1 Euro, just let me know in which account to deposit it. It will be well spent I’m sure.